These two collections are ideal introductions to romantic music, simpler than Hasselmans or Renié musically, yet opening a door into the enchanting sound world of Godefroid, whose main characteristic is to bring out the singing quality of the harp. These great learning pieces increase gradually in difficulty, giving students of all levels something attractive to work on, and providing working harpists with Victorian-style repertoire for recital encores, or special occasions ranging from weddings and parties to church services and funerals. 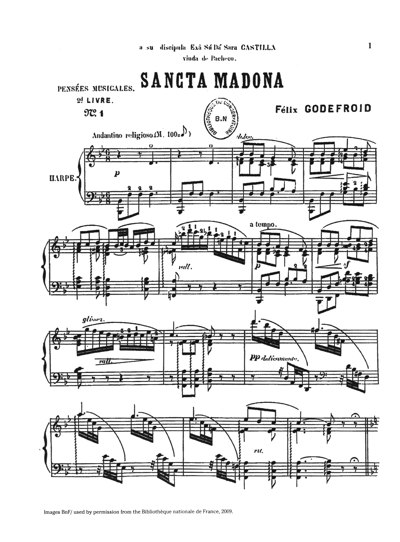 In Volume 2, Sancta Madona is another example of devotional music filled with tender expression. Godefroid again introduces his signature cross-fingered patterns, and often allows the tune to be carried by the left hand. Chant Indou barely registers as an exotic tune, except for the drone-like repeated chords and a melody that moves along intervals of pentatonic character, always finding repose on the often-repeated dominant note of the key. After a first full statement, the melody returns, clothed in shirring arpeggio patterns of utmost delicacy. Jadis brings back the mood of an ancient formal dance, the minuet. A fun piece to play, it is filled with injunctions to muffle the bass, which, together with short phrase snippets unusual to Godefroid, the master of long phrases, contribute to its neo-classic mood. Bois Solitaire, published separately, recorded and popularized by Susann McDonald as Romance Without Words, is a perfect piece to reinforce directional placing and to learn to phrase a song expressively with the right thumb. The title evokes the German poet Joseph von Eichendorff’s concept of Waldeinsamkeit, solitude in the woods, made famous by all the 19th (and 20th) century German composers who set his poetry to music. The American transcendentalist Ralph Waldo Emerson was inspired to write his own poem with that title in 1858 – it’s the first Google result you come upon in a search. Les Voix de la Nuit requires a loose wrist to play as fast and evenly as possible. Godefroid adds a line for “invisible three-voiced women’s choir” that can be sung to great effect. 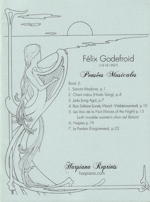 The Belgian harpist Sophie Hallynck recorded this on her Godefroid CD (Musique en Wallonie 0637). Harpiana has created separate choir parts for ease of performance (see under Les Voix de la Nuit as a separate item). Naples, in 6/8 barcarolle rhythm, features the tune in the 4th finger of the right hand, which is not so easy because of the thirds that fill up the harmony. Le Pardon, another song without words, brings us what Godefroid does best: to emote with a beautiful tune that is strongly supported by a substantial left hand accompaniment, gradually building emotionally satisfying momentum in a graceful surge. Both volumes are facsimile editions. Thus the few mistakes (engravers made mistakes in the olden days, too) or faded markings of the original printed copies have not been corrected, but can be figured out fairly easily.